So you have one of those 12V Ultra-Compact Reciprocating Saws, but how is your supply of blades for the tool? Thankfully most of these compact saws come with a couple of the smaller than usual blades with your purchase, but where do you turn when you have used them up? 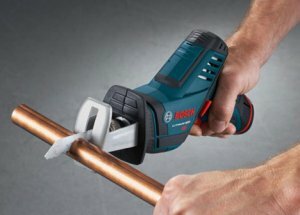 Bosch wants you to turn to them and their new line of Pocket Reciprocating Saw Blades. Sure you can use the standard 6" or 12" reciprocating saw blade in your ultra-compact reciprocating saw, but that is not really practical. The whole point of these small cordless saws is to be able to fit into smaller spaces. A 12" recip blade pretty much doubles the size of the tool. Bosch is taking on the task of manufacturing a full line of the smaller 4" "pocket" reciprocating blades and is promising that the blades will "carry all of the quality, speed and long-life attributes Bosch blades have always stood for". Though 12V cordless saws are limited in power and scope of use, Bosch is producing a full line of metal, and all purpose wood blades because these pocket blades can be just as easily used in your full-size saw when space is limited. According to Bosch, these blades are available now. You can check the Bosch 2012 catalog for Bosch's current pocket blade offerings.